Captain Tim's Awesome Cocktail Sauce! 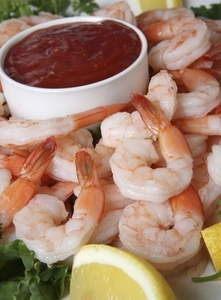 Our Cocktail sauce is a must have to go along with your Shrimp order! Capt. Tims Cocktail sauce has a ton of flavor, and just the right amount of horseradish to make this a winner! Great On Our Shrimp, Native Oysters, and Our Fresh Littleneck Clams! Capt. Tim's Cocktail Sauce Is The Perfect Blended Cocktail Sauce! Not To Hot, Not To Sweet, But Has A Nice Kick To It! A must have to go along with your Shrimp Cocktail, Oysters, or Littlenecks! Order Capt. Tims Shrimp Cocktail Sauce By 10am EST, And Enjoy It With Your Shrimp Cocktail For Dinner Tomorrow! How Easy Is That! just the right kick, glad we ordered it! We added a bit of hot sauce to it, and it was right on!